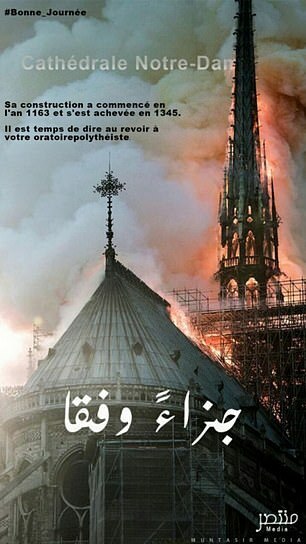 A poster of the blazing cathedral appeared online accompanied by the words, ‘Have a good day,’ and was created by the ISIS affiliated Al-Muntasir group according to the Terrorism Research & Analysis Consortium. The jihadists referred to the catastrophe as ‘retribution and punishment,’ SITE intelligence reported. More coverage by Daily Mail. It is not time to say goodbye to Christianity, and never to the Christ, even as we celebrate his resurrection this Easter Sunday. The Cross and the altar still stand. This entry was posted in Current Events, Religion, Terrorism, The Culture. Bookmark the permalink. That rubble with the cross still standing is a powerful testament. On other web sites, I have been trying to make the case to preserve ND in it’s current state, not “rebuild more beautiful”. My vision would be to keep ND as a sacred holy open air Cathedral of Paris, imagine open air mass in this once great space. What remains is more beautiful and inspiring to God than what will be added on by the secular state. 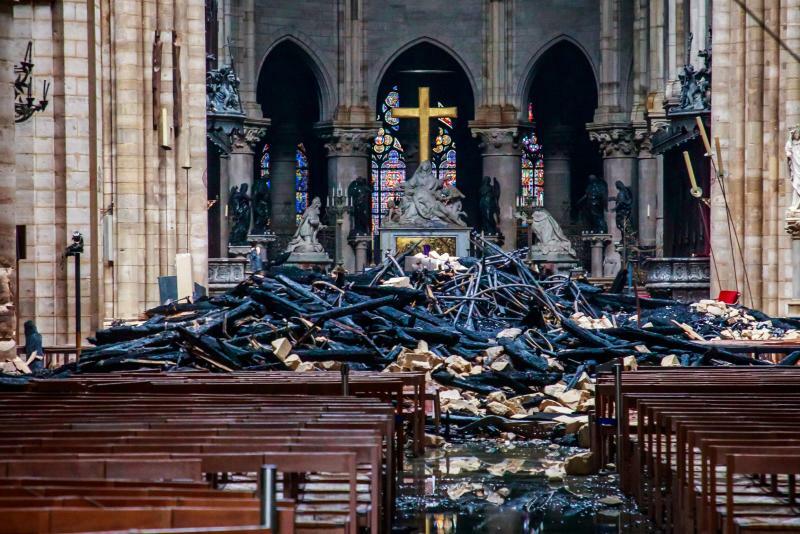 Keep that beautiful cross standing up against the rubble; now that would be a testament to our God, our faith, our belief that Catholicism transcends all. Our faith rises above the ashes of time, the ashes of hell, the ashes of evil, the ashes of destruction. I can envision pilgrimages to ND just to witness that cross standing above the burn remains of the Church. It seems to be a message from God – Look at me, don’t look away. It would be a shame if that was the message and Paris decides to remove it. I think it is right to rebuild. To leave it a ruin is to give in to people such as those who published that poster. They wouldn’t understand the power of the cross amidst the rubble. Let’s ignore them and demonstrate, by rebuilding, that our God and the symbols of Christianity remain in charge. So far I’ve heard on two different sites, neither considered definitive, that some of those involved with the cathedral’s maintenance are saying the fire was not an accident. It may just be anger speaking but the sudden rush to blame the fire on an accident, even before the smoke settled, bothers me. I agree with you that it is a huge mistake – if not a red flag – to brush this aside as an accident when they have no idea whether or not that is true. 1. The exact cause of the blaze is still unknown. 2. The exact cause of the blaze is still unknown, but it has been ruled an accident (despite the fact that the exact cause of the blaze is still unknown). 3. The exact cause of the blaze is still unknown, but Islam is the real victim here. 4. The exact cause of the blaze is still unknown which means the damage has not been thoroughly assessed, but it’s not arson. 5. The exact cause of the blaze is still unknown which means the damage has not been thoroughly assessed, but Macron is setting up an international appeal for funding to rebuild despite not knowing how much is needed because the damage has not been thoroughly assessed. And the 12 church attacks in the week prior? And the state determined arson at St Sulpice? And 911 was an attack by Zionist forces designed to revive flagging US support for Israel and split the US/Islamic growing friendship. Still believe that the media – Fox included – are preparing a file of excuses for when it starts here. As moving as the altar is the statue of Mary holding Christ. Notre Dame, Our Lady, always presenting Christ to His people, even when she held him, taken down from the cross. The most touching thing to me about the Pieta is that outstretched left hand of hers, reaching out to us, even in her sorrow and agony and His death. Notre Dame is so much more to the world than a beautiful cathedral. People don’t grasp so well why it matters, but it matters because the Mother of God gives us her son. That can’t be added to or subtracted from in the final result. I hope that Notre Dame is rebuilt and stands ever more glorious. I personally don’t think that the secularists can undo what is, represented so well, so beautifully, so lastingly in the Cathedral in Paris. She is more than stone, mortar, wood, and even rose windows and spires. Here is a surveillance video from Citizen Free Press and you will begin thinking this church was intentionally ignited. Restorative Master craftsmen do not leave things to chance, they close clean and put away all possible fire starters ect… and rarely are careless or negligent although many have wanted to blame the crew of which were not there when the fire broke out. But there is a person on the roof and it looks as though they caused the spark that caused the fire. Intentionally!